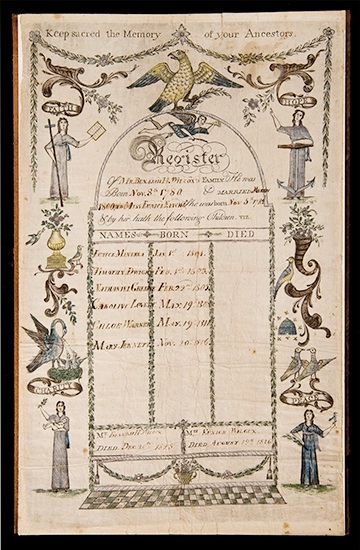 Over the centuries, families have kept their own records of their history – by writing it in family Bibles; by sewing it into samplers and other needlework; by having it engraved onto objects; and sometimes by writing it into preprinted family registers. 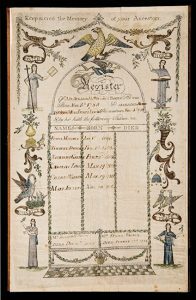 NEHGS has launched a new database of family registers that have one thing in common: all were originally engraved by English-born Richard Brunton, who lived in New England in the years during and after the Revolution. And that’s what the families who purchased the registers did, giving us legible and tangible records of their loved ones’ existence. Seeing the information written in an ancestor’s hand – often by a person who witnessed the particular life event – gives us a connection to that person and family that somehow feels more direct than government or parish records. And the registers themselves are works of art, illustrated with cornucopias, birds, human figures, beehives, flowers, and other motifs, sometimes in brilliant colors. The Brunton registers – from museums, archives, libraries, and private collections – were owned by families with surnames like Bacon, Coffin, Daniels, Foster, Griffin, Hill, Holden, Moody, Wilcox, and Willard. The database allows users to search by first name, last name, spouse or parent name, record type, year, and keyword. This database complements a database of family tree samplers collected by Dan and Marty Campanelli, and emphasizes the rich stories that family objects can tell us, decades and centuries after their first creation. Indeed, they do keep sacred the memory of ancestors. Penny – many years ago, I was informed that a cemetery had cremated a stillborn son of some ancestor. I asked first cousins if they knew who this was and one responded saying that it was on the engraved tray that she had. What tray was she talking about? She sent me pictures of the tray. On the front my great grandparents, grandparents, parents, aunts and uncles, some spouses and some children. One could tell the cut-off date by who had been included. On the back of the tray, on a chart, were the names of my grandparents and their children with heights and weights. The grandparents’ information is shown only for one year while the children go on for twelve years. Did one child say no more? There was room for one more year but nothing. There is an image of a Brunton family register of the family of Angus Nickelson and Sarah Platt, likely made ca. 1789-1791, in the book, Albert C. Bates, _An Early Connecticut Engraver and his Work_ (1906), available online at https://archive.org/stream/earlyconnecticut00bate#page/28/mode/2up. This family register is unlike the 10 examples in the Brunton database on the American Ancestors website (http://www.americanancestors.org/databases/family-registers-by-richard-brunton/image/?pageName=1&volumeId=40107) in that the names and dates were engraved. On the 10 examples in the database, the family filled in the names and dates. This Nickelson family register is also unusual in that Brunton engraved his own name in the lower right corner, “R. Brunton, Sculp.” (See the detail reproduced in the first illustration in the book.) I wonder if families were less eager to have Brunton’s name on their registers after his conviction. What an interesting discovery. Thank u 4 sharing.